This week we have finally received a DualMiner USB Scrypt ASIC based on a single Gridchip GC3355 processor that is capable of mining both BTC and LTC or only LTC (SHA-256 and Scrypt), so we can share some of our first impressions already using the device for a day. The device uses a dip switch to switch between the mode active at the moment (LTC and BTC and LTC Only) and there are two virtual COM ports available – one for BTC or other SHA-256 and one for LTC or other Scrypt crypto mining (you need to install a virtual USB to COM driver from here). When you are in BTC and LTC mining mode you are supposed to get about 500 MH/s for SHA-256 (BTC) along with about 40 KH/s for Scrypt (LTC), however we are and you are also probably going to be more interested in the performance of the LTC (Scrypt) mining mode only as this way the ASIC uses less power and provides more performance and you better go with 70 KH/s LTC instead of 40 KH/s LTC and 500 MH/s BTC nowadays. One important thing is that when the device is in LTC mode only you need to use the BTC COM port (the first one) and when operating in Dual mode the first COM is for BTC and the second for LTC. DualMiner USB Scrypt ASIC uses a modified version of cgminer that comes along with an extra GUI that might be more appearing to the new to mining users, however we prefer to use directly the cgminer from the console (version 3.1.1). The extra parameters you are passing to the cgminer include “–lo” for the LTC only mode (Scrypt only), “-S //./COM12” to set the COM port used by the device and “–dualminer-pll 850” to set the operating frequency of the chip. When you switch to LTC mode only the ASIC increases the voltage to 1.2V and uses 850 MHz to achieve 70 KH/s, in BTC & LTC mode apparently the voltage is 0.9V and the clock frequency is 550 MHz for 500 MH/s and 40 KH/s respectively. You can try increasing the MHz value a bit to about 900 to squeeze a bit more performance, though you should be careful as not all devices apparently can work at that frequency and you better have some sort of extra cooling. Our tests show that when the device is used in a pool, the reported hashrate is a bit above 70 KH/s, the screenshot is from ScryptGuild with difficulty set to 16. You need to set the difficulty for the worker lower in order to get good actual performance due to the not so high hashrate of these miners. For the first 24 hours our DualMiner USB Scrypt ASIC has managed to get away with just about 0.15% HW errors running at 850 MHz with an extra fan for better cooling, s things are looking pretty good. We are going to perform some more tests and publish them here in the next few days, so stay tuned for more information abut these USB ASICs based on Gridseed’s GC3355 chips. 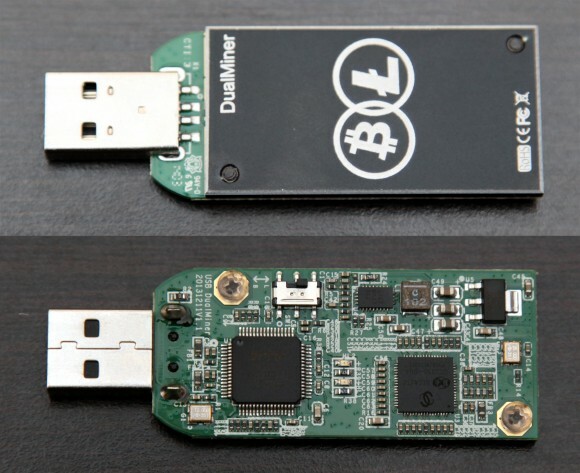 And while we like how things are working with this low power Scrypt ASIC, we are not going to recommend the purchase of single units due to the low hashrate that each device provides and if you are going to invest in more of these USB ASICs, then you might want to check out the 5-chip Gridseed miners supposed to offer 300 MH/s per devices – these will cost you less for the same total performance. For the moment the price at which the DualMiner USB ASICs are being sold they are not that attractive choice, and we have ordered one just to play around with it. We are waiting for one of the larger 5-chip units to arrive in the next few days, so we are going to be reviewing it as well soon.